When a promising country music singer on the verge of stardom mysteriously dies after undergoing a routine medical procedure, Kate Katelinson, an investigative reporter for the Nashville Herald, becomes personally tied to the case. After sources connected to the reporter’s investigation start dying, Kate finds herself thrust into a twisted labyrinth of betrayal, corruption, and murder. Armed with only her investigative instincts and an unlikely alliance of friends, the reporter enters a terrifying game of cat-and-mouse with a mastermind more powerful than she could have ever anticipated. To complicate matters, Kate finds herself torn between her brilliant ex fiancé, and a charismatic hospital executive who both may be after more than her heart. In her debut novel Nashville Mercy, Dr. M. Maitland DeLand takes readers through a rollercoaster ride of suspense while touching upon some of the most pressing social and healthcare issues of the 21st century. 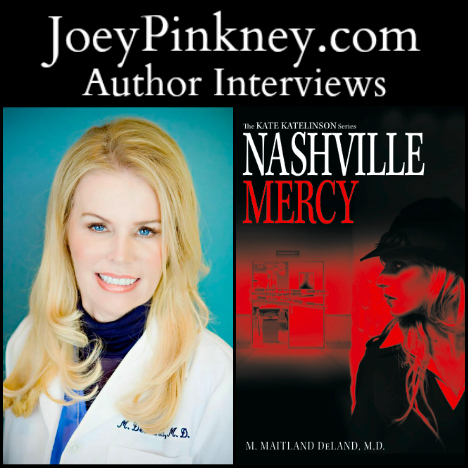 Joey Pinkney: Where did you get the inspiration to write Nashville Mercy? M. Maitland DeLand: Well, I started by writing children’s books, and I used my medical knowledge as a physician to create books that were medically accurate, and my experience as an oncologist, dealing with young children, to create books that were easy for children to understand and not scary but honest. Then, I wanted to get into something more “adult” and so I started to take my medical knowledge and started to think about how I could create medically accurate murder mysteries. Not like the TV shows, CSI, etc., where everything is exaggerated, but something more realistic. Things I know could happen. JP: What sets Nashville Mercy apart from other books in the same genre? MMD: It’s accurate in terms of the medical content! I also think having my female protagonist, who is so smart and clever, but also weak when it comes to falling in love, makes her relatable. I hope young female readers will be able to connect with her. She isn’t super woman. She tries to be, but she makes mistakes, like we all do. JP: As an author, what are the keys to your success that lead to Nashville Mercy getting out to the public? MMD: I cannot overemphasize the valuable work a professional PR person can provide, and how important it is to listen to their suggestions. As a writer and author, sometimes, you think that your work is so great, and it’s hard to think about spending all the time (and money!) with a big campaign. But, no matter how great your work is, what good is it if you don’t know how to get it noticed? A valuable PR campaign team knows when to tell you what to do, what is happening in the PR world, and what is a waste of time. You’re the writer, and the author, and they know where to take you. I also think that it’s important to be nice to everybody you meet, and I mean EVERYBODY! I’ve met the most fascinating people on airplanes, in restaurants, all because I turned to them and started a friendly conversation. Almost always, you’ll gain a fan and a reader of your material. JP: As an author, what is your writing process? How long did it take you to start and finish Nashville Mercy? MMD: It took me months and months. I remember I read once that John Waters, director of Hairspray, would get up at 6am and start writing and go through the day. I wish I could do that!! That’s absolutely phenomenal – I need to know his trick! For me, I have to write when I feel inspired, whether that’s in the morning, while eating dinner, etc. I have to hope that comes more than once a year! JP: What’s next for M. Maitland DeLand? MMD: More mystery novels and definitely more children’s books. I am also working on a documentary, and an iPhone app.